This interesting Scottish and Northern English surname is of Anglo-Saxon origin, and is a locational name from a number of places thus called. 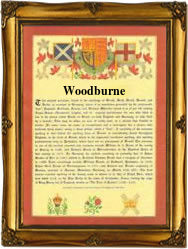 In Scotland, Woodburn is found in the former counties of Ayrshire, Kincardineshire and Midlothian, and in England it is found in Northumberland, and is recorded as "Wodeburn" in the Calendar of Documents relating to Scotland (1265). All places share the same meaning and derivation, which is from the Olde English pre 7th Century "wudu", wood, and "burna", stream; hence, "stream flowing through a wood". During the Middle Ages, when migration for the purpose of job-seeking was becoming more common, people often took their former village name as a means of identification, thus resulting in a wide dispersal of the name. In the modern idiom the surname can be found as Woodburn and Woodburne. Recordings of the surname from various Church Registers include: the marriage of James Woodburn and Margaret Atkinson on November 28th 1570, at Aldingham, Lancashire; the marriage of Allic Woodburn and James Keene at Priory Church, Cartmel, Lancashire, on July 30th 1581; and the marriage of Jannet Woodburne and William Ker on November 19th 1611, at South Leigh, Midlothian. A Coat of Arms granted to the family depicts a silver cross engrailed on a black shield, the Crest being out of a mural coronet an eagles head all proper. The first recorded spelling of the family name is shown to be that of Jonete Wodburn, which was dated 1506, in the "Muniments of the Royal Burgh of Irvine", Scotland, during the reign of King James 1V of Scotland, 1488 - 1513. Surnames became necessary when governments introduced personal taxation. In England this was known as Poll Tax. Throughout the centuries, surnames in every country have continued to "develop" often leading to astonishing variants of the original spelling.